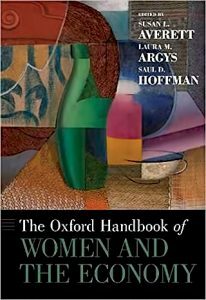 Susan Averett, Charles A. Dana Professor of Economics, is co-editor of this first comprehensive handbook focusing on the economic lives of women over the past century. The evolution of women and blurring of traditional gender roles—in homes, in schools, and in the workplace—have had tremendous and far-reaching impact. This area of study has been a focal point of Averett’s research and teaching within both the economics department and women’s and gender studies program. Averett and her collaborators began the endeavor three years ago, working together to create a proposal, mapping out a broad yet in-depth analysis on an array of subjects with an emphasis on marriage and fertility, the labor market, and policy issues. They recruited top scholars and up-and-coming researchers from around the world to contribute their findings and perspectives. The book was published this year by Oxford University Press. During the 18th and 19th centuries, hymnals were an integral part of people’s religious lives. As Chris Phillips, associate professor of English, points out, they were used for more than singing. They were children’s first books, gave readers an inaugural experience with printed poetry before 1900, and served as repositories of family history and commentary. They also provided space to write notes in church, usually gossipy observations about another parishioner’s new bonnet or dress, and carried everything from grocery lists to train tickets to business letters. Like cellphones of today, the leather-bound embossed hymnals were a part of everyday life and an extension of one’s self. 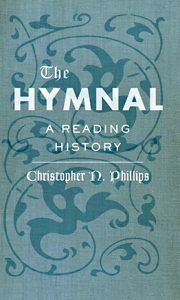 Describing hymnals as “Christian furniture,” Phillips tells the stories of how people used them in private and personal use, noting many songs contained within them still resonate with us today, evoking memories of Sunday worship, family dinners, and music of a shared past. The book was published this year by Johns Hopkins University Press. Arnold Offner, Cornelia F. Hugel Professor Emeritus of History, attempts to restore the oft-maligned former vice president and senator to the pantheon of great American statesmen. Offner was drawn to Humphrey as a strong advocate of the Roosevelt-Truman liberal tradition. 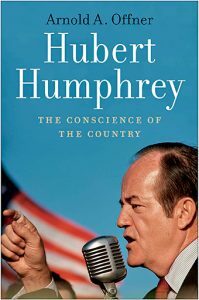 “Humphrey was the most liberal, and most successful, legislator of the 20th century,” he says. Humphrey, a political giant of his era, has been largely forgotten. Offner’s book, the first biography of him since 1984, recaptures the man’s political life and achievements. Based on exhaustive research, it explains his critical role in masterminding through the Senate and into law the first nuclear arms limitation treaty in 1963 and the historic 1964 Civil Rights Act. The book also sheds new light on how President Lyndon Johnson undermined Humphrey’s campaign for the presidency in 1968 against Richard Nixon because Johnson favored the Republican’s more hawkish views on the Vietnam War. The book was published this year by Yale University Press. 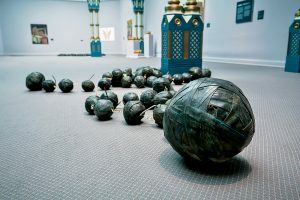 Pennsylvania Academy of the Fine Arts showcased the work of artists Didier William and Nestor Armando Gil, associate professor of art, in an exhibition this summer in both the Fisher Brooks and Morris Galleries in Philadelphia. SWARM. was organized into five thematic sections that explore revolution, spirituality, process, migratory identity, and affect, in which William and Gil reveal their multilayered Haitian and Cuban heritages, respectively, inflected by the diasporic communities they call home in the U.S. Viewers encountered more than 30 works in a variety of media such as printmaking, painting, sculpture, installation, and performance. The collaboration between Gil and William was the brainchild of Curlee Raven Holton, Roth Professor Emeritus of Art.